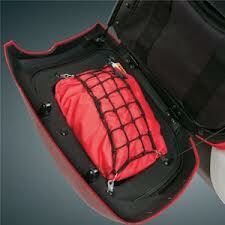 Big Bike Parts® introduces an easy and inexpensive Saddlebag and Trunk Lid Net Organizer for the Can Am Spyder RT. 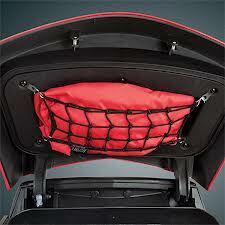 These lid nets easily hold rain gear, covers or other items in the lid recess with a bungee net system. Small durable nylon clips mount to existing screws and clip the net into place with simple ‘S’ hooks, allowing easy access and removal. This 3pc lid net set is for Can Am Spyder RT.